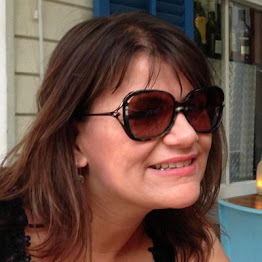 My husband has found a new natural skincare brand Rehab London. Developed by celebrity make up artist Lisa Hilton who felt there was nothing available for the male stars on set, it's quickly had great media exposure being endorsed by Take That and Simon Cowell amongst others. What's special about the products is that each natural product is paraben and sulphate free, with uncomplicated instructions but the products really care for male skin. Containing Hawaiian water algae known for its healing properties and suitable for sensitive skin, it has a light fresh smell, and the products glide on and leave the skin feel refreshed and smooth. It also protects skin from UVA and UVB rays providing perfect protection from the sun. 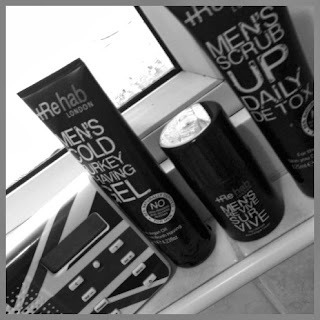 The main products are Men's Morning Glory and Men's No Shine Moisturiser, Men's Scrub Up Daily Detox, Men's Cold Turkey Shaving Gel, Men's Calm Balm and Men's Revive Survive their 'hero' product, the latter is a mens 10 minute make over cream to deal with the signs of fatigue, great for jet lag in particular. 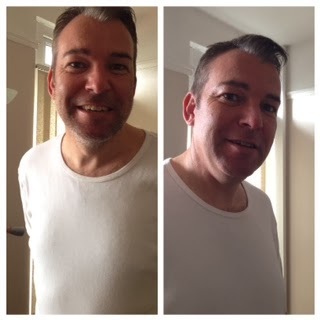 The first product my husband tested was the Scrub Up Daily Detox. This granular scrub didn't feel harsh on the skin and left his face clean without feeling dry and tight. He thought this was straight forward to use and a great product for smoother clear skin. Then he tried the men's Cold Turkey Shaving Gel. This shaving gel has a mild scent which is not over powering, perfect when you don't want the smell to clash with your aftershave. He thought this low lather product, with the clear gel would be good for definition if you want to precision cut your moustache and side burns. The last product he tried was the Men's Revive Survive. This smooth light comfort cream rubbed into the skin well, and left his skin feeling rejuvenated Again the extremely light fragrance won't interfere with your aftershave, a great product when you feel your skin needs that little bit of TLC. This Christmas the Ultimate Christmas Shaving Pack is available from John Lewis. A stylish gift for those that like taking care of their skin the pack contains 3 full-size products, essential to achieve the perfect shave. 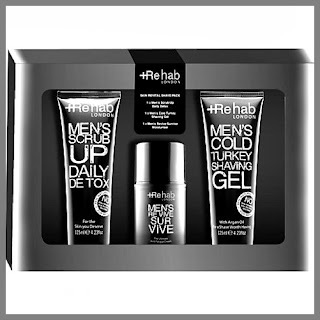 Comprising of Scrub Up Daily Detox (125ml), Men’s Revive Survive (50ml) and Cold Turkey Shaving Gel (125ml), they claim the skin looks rejuvenated and revitalised in just minutes. You can buy Rehab London at a number of good retailers including John Lewis, Harvey Nichols, Selfridges and Lloyds Pharmacy or at their online store. So would he recommend Rehab London? Yes definitely, and my opinion, his skin certainly feels softer when I give him a kiss and that's a plus in my book! The Hawaiian water algae sounds good, like natural products when I buy for hubby, his skin can get quite sore if he is not careful. Will be having a look for Christmas. This will help heal and soothe the skin. Oh I doubt I could get my husband to use any product dubbed skincare. He is a manly man, with a big beard and snorts if I say, 'do you want anything?' when I am shopping online for skincare products. Saying that they look fab and he might just get them for Christmas! Ha! Thank you Esther I will tell him.